While housebound recovering from surgery I discovered and binged watched the Starz series "Black Sails" and loved every episode. At the end, I was left with a strong desire to game the period and started looking around for available rules, figures and ships. For rules, I am leaning towards Blood and Plunder although I could be persuaded otherwise. I've ordered a copy and am eagerly waiting for them to arrive. Your thoughts, recommendations and suggestions would be most welcome. In respect to ships, I am uninterested in the many MDF variants available. Usually, my leisure time is at a premium and I would rather spend time painting than assembling so I am leaning towards resin cast or similar. After some web searching, I narrowed my list to Ainsty, OG and Blood and Plunder. Can anyone out there tell me whether the ships produced by these three manufacturers are compatible with each other? I couldn't tell whether the ships were built to scale and therefore likely compatible or whether they were built with playability in mind which could throw scale off. Again, your thoughts, suggestions and recommendations would be much appreciated. There is a TSATF variant called The Sword in the Caribbean. I don't recall any naval rules; I think it's a "pirate raid" theme, though I imagine you could as easily fight on the decks of a ship as on land. Peter Pig produces Pieces of Eight which is a whole campaign system including naval rules for sea battles and land rules for shore raids. Not sure this will be much help, but I remember being very, very impressed with Pirates! by Flagship Games. Scale Creep Games used to carry them. They are almost entirely for ship to ship action (though surely they could be tweaked to handle land-based actions also), but the rules are pretty simple, very much your beer and pretzel variety, and all is written with tongue very much in cheek. I have heard from reliable sources it is about the perfect convention game or introduction to the hobby for newbies. An odd feature is that their main setting is for Renaissance actions – you will find stats for galleys, for example – but I believe most gamers used them for the Golden Age of Piracy (17th-18th centuries) with no trouble at all. They may be worth a look, at any rate. I never actually played them (other projects distracted), but to this day it remains one of those "maybe I should have done that" periods. Hope this gives some food for thought until other, more knowledgeable folks check in. I have the 1st and 3rd editions (3rd also has optional rules for Floaties and Sinkies). When I started pirates many years ago, I bought every set of rules available (of course). Flagship Games Pirates! was the best. Covered sail as well as oared ships. Fantasy as well as historical. I like Pirates by Flagship games as well. My only critique is the ship to ship firing procedure. You guess the range between ships when you fire which became far too easy the closer we got resulting in automatic hits most of the time. There are rules for landing parties and fantasy stuff too. Oh yeah, forgot the range thing cause I always toss out range guessing rules in favour of a dice roll. Thanks for your input. Not sure about a set of rules that requires guessing of ranges but I will take a peak and give them a read through. I'm a big fan of TSATF but had forgotten about the pirate variant. 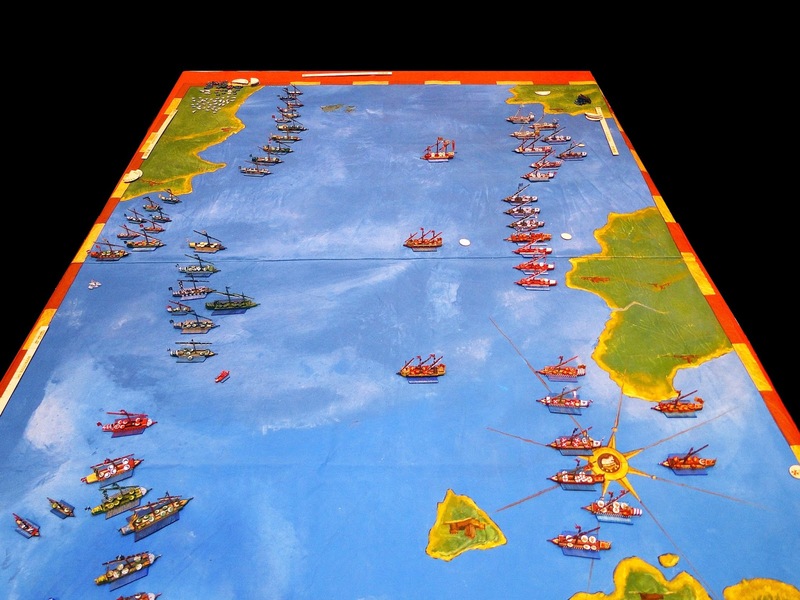 However, the lack of rules for naval combat is a non starter. Although set in a period slightly earlier than I would like, Blood and Plunder seems like it might hit the spot. Legends of the Sea (?) has also piqued my interest. The search continues. Alcibiades, just to confirm, the Pirates! rules from Scale Creep (nee Flagship Games) does also have hand to hand melee rules and easily does land engagements. Being a friend of the author, I have seen his games usually include 2-3 inhabited islands that can either be nuisances, or the key objective for the game. For pirates in taverns or on land, the venerable Blood and Swash / Thunder and Plunder is still pretty good. Most of the systems were later incorporated into GASLIGHT for both VSF and Pulp games. There are no real sailing ship rules in either of these systems. Thank you all for the kind words about our Pirates, Miniature Battles on the High Seas, rules. Chuck 05- you totally have the correct attitude towards guessing ranges vs being up close- being able to hit always at close range was exactly the expected result wanted, and very historically accurate. Like Black Cavalier mentioned, We sold the production and rights to Scale Creep miniatures a few years ago. I've now gone on to make other naval rules and ships for Galleys Guns and Glory! which represents naval actions during the renaissance. Cheers- and remember to always keep your powder dry! I like Pieces of Eight by Peter Pig. Their 1/600 ships are great & the land raids are excellent. I would strongly recommend Blood & Plunder. The rules are excellent (really nice initiative/action mechanic) and deliver a real period feel. The range of models is also first class, and growing, and as for the ships – they are fabulous and a joy to paint. Ainsty ships are nice too – and compatible – I don't have any OG so won't comment. Also, there is a whole heap of new stuff coming in the next month or so – and there is talk of them reopening the pledge manager on Kickstarter for a few days next week for very late backers (and if you live in the U.K. is definitely worth considering because you won't get hit for customs duties). As to the time period – late 17th century has just as much piratey goodness as 18th, but if you are a true "Golden Age guy" the next expansion is slated to move the timeline forward. Boilers and Breechloaders is the expansion for TSATF that you want. While it's aimed at the late 19th century you can just leave out the better guns and armored ships. Blood and Plunder is the superior set for Pirating. It's not even close in my opinion. It has taken the world by storm. Very popular vs the other sets mentioned. Blood & Plunder is very good, and it's the first set I've seen that really blends land and sea action nicely. En Garde is also good for smaller scale skirmishes. Just a heads up the Old glory line of ships look fine next to the Blood and Plunder ships. The only thing is you might have to make your own ships diagram and get it approved by your opponents.